Several months ago the Jameco newsletter featured a new, pin compatible, version of the 555 timer called the CSS555, developed by Custom Silicon Solutions Inc. The CSS555 contains, among other features, a programmable six-decade counter that enables the creation of very long time delays using low timing component values. It was just the feature I needed for a project requiring a time delay of up to eight hours. However, there was one catch: out of the package this chip functions like a standard 555 timer and you must configure it to take advantage of these extended features. So I set out to program the chip to take a longer term perspective. For someone like me who looks for any excuse to build another electronics project, this obstacle was an opportunity. I decided to build my own programmer to help get the job done. I considered a number of possible options, including a stand-alone microprocessor based programmer, however, I was looking for an approach that would be quick and relatively inexpensive. Then it dawned on me that the solution was sitting right there in my closet. The "solution" was an old laptop with a printer/parallel port. It was perfect since it would require minimal additional hardware, just a DB25 connector and a few components. Component Name Part Description Manufacturer Part No. As you can see in Figure 1, the programmer circuit is very simple. IC1 buffers the signals from the parallel port. IC2 is the CSS555 chip to be programmed. The figure shows the pin assignments when the chip is in programming mode. Transistor Q1 drives CSS555 pin 5 low when Enable is asserted. This disables normal timing mode and enables programming mode. Note that when Q1 is off (programming mode not enabled) the voltage at pin 5 is pulled up to 2/3 of the supply voltage by an internal voltage divider. The following table shows my pin assignments for the CSS555 in programming mode and the corresponding parallel port signals. On my old laptop the parallel port base address is H378. So, the port addresses are Data register = H378, Status register = H379, Control register = H37a. I chose to connect the output from the CSS555 (pin 3) to bit 3 of the status port register (DB25 pin 15). Bits 0 and 1 of the control port are inverted by hardware. For example if bit 0 of the control port register is set to 1 the corresponding control port pin will be low. So, you must invert the bit before it is sent to the control port. For example, to set the CSS555 SCLK pin to low, you must set bit 1 of the control port register to high. Regarding the -Enable pin, remember that Transistor Q1 must be turned on to drive Enable low. This means that the pin associated with bit 0 of the control port register must be high. So to set -enable low you set bit 0 of the control port register to low. The CSS555 contains a serial interface through which you can store configuration data in the on chip EEPROM or read current configuration data from it. If you are using the CSS555C version of this chip, you can also adjust the value of the internal 100pf timing capacitor through this interface. To communicate with the CSS555 you send a one or two byte command via the serial interface. The first byte of the command is the control byte. It specifies whether you are writing new configuration data to the EEPROM or reading current data from it. The following table shows the possible control byte values. The least significant four bits specify the command (read EEPROM or program EEPROM). 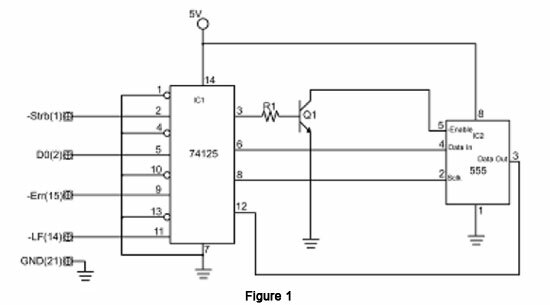 The most significant four bits specify configuration data or capacitor trim data that is to be read from or written to the EEPROM. If you are programming the EEPROM with configuration or capacitor trim data (CSS555C), the command will include a second byte that contains the data. The configuration data byte is separated into six fields. You set four of these fields with the appropriate values to specify the counter setting, timer operating mode, power setting, and upper and lower trip levels. For example, to configure the CSS555 with the settings Counter = 10, mode = monostable, power = low, and trip levels = standard you send the two byte command 00010010 00011001 (or H12 H19). The location and function of each field are described in the following table. Bits 0-2 Decade counter setting (timing capacitor multiplier value) You set this bit field to one of the values listed below to specify the corresponding timing capacitor multiplier value. If the multiplier value is set to 1 (000 or 111) the counter is disabled and the CS555 functions like a standard 555. Bits 3 Timer operating mode You set this bit field to one of the values below to specify the timer operating mode. If you're using the CSS555C version you can set the internal capacitor to any value from ~85pF to ~115pF in increments of approximately .12pF. To do this you set the second byte of the Program Capacitor Trim Data command to a value between H00 (85pF) and H255 (115pF). For example, the two byte command 00100010 11111111 (or H22 HFF) will set the internal capacitor value to approximately 115pF. The default values, set at the factory for operation as a standard 555 timer, are: Counter = 1, trip levels = 1/3 & 2/3 VDD and internal capacitor = 100pF (for the CSS555C). I wrote the programmer software in a variant of a language called Forth. Forth is not well known and has a syntax that can take a while to get used to. You can of course, use the programming language of your choice as long as it includes functions for hardware I/O port access. As you create your code, you should keep the following in mind. To program the EEPROM, the software must perform the following steps. Figure 2 shows the resulting timing diagram. To get current configuration data from the EEPROM the software performs the following steps. Figure 3 shows the resulting timing diagram. Bits 0 and 1 of the control port are inverted by hardware. For example, if bit 0 of the control port register is set to 1 the corresponding control port pin will be low. So, you must invert the bit before it is sent to the control port. To set the CSS555 SCLK pin to low, you must set bit 1 of the control port register to high. Regarding the -Enable pin, remember that Transistor Q1 must be turned on to drive Enable low. This means that the pin associated with bit 0 of the control port register must be high. So to set -Enable low you set bit 0 of the control port register to low. The following pseudocode examples illustrate how to set SCLK and -Enable. Outport(sdata, Dataport) // Send the data byte to the data port. ClkHi() // shifted in on the rising clock pulse. sdata = Shr(sdata, 1) // Right shift to send the next bit. The operating system running on my old laptop is Windows 95, which provides full access to the parallel port. However, later versions of Windows restrict user level access to the parallel port. There are a number of programming solutions to this problem. One of the more popular is a dll called Inpout32.dll, which enables your application to access the parallel port under all versions of Windows. It is available as a free download from Logix4U. If you are new to parallel port programming, there is no shortage of information on the Internet. One of the best sources I've found is Jan Axelson's Parallel Port Central website at http://www.lvr.com/parport.htm. The site contains a large collection of information about the PC parallel port and contains links to related websites. Thanks to Frank Bohac of Custom Silicon Solutions Inc. for providing valuable technical assistance and for the fast turnaround on the updated app notes. Phil Kane has been a technical writer in the software industry more than 10 years. He has also occasionally authored articles for miscellaneous electronics enthusiast magazines. If you have an electronics story or project you'd like to share, please email [email protected].